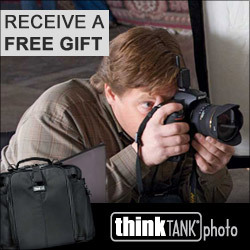 Our friends at Think Tank Photo just announced that they’ve launched their new Vision Shoulder Bag Series. The bags are designed to fit DSLR and Mirrorless camera gear with pro-sized lenses and hoods, and are constructed from durable, yet stylish, weather-resistant materials. Vision is an ideal carry solution for professional and aspiring photographers alike. Available in three sizes (the Vision 10, 13, and 15) the Vision Series fits a wide variety of DSLR and Mirrorless camera kits in a customizable padded divider system, providing ample room for pro-sized lenses and hoods. The shoulder bags also feature dedicated pockets for smartphones, 10-inch tablets, and laptops up to 15-inches. Constructed with durable, yet stylish, weather-resistant materials, Vision offers the access, security, and quality you’ve come to expect from Think Tank. Don't forget to click our link to get FREE gear and free shipping for orders over $50. Santa Rosa, Calif. – Great Photography Begins with a Vision. The ability to visualize a picture before you release the shutter is essential to getting that perfect shot. With the Vision Shoulder Bag Series, you can get all the right gear to the right place, so you can turn your vision into a great photo. Sized for professional lenses, the Vision Shoulder Bag Series is designed not only for capacity but also for security. With its zippered top closure, your gear will stay safe and in place. This Internal zippered flap also provides a secure closure for additional weather and theft protection, and tucks away when not in use. The Vision series fits wide variety of DSLR and Mirrorless camera kits in a customizable padded divider system, providing ample room for pro-sized lenses and hoods. The shoulder bags also feature dedicated pockets for smartphones, 10-inch tablets, and laptops up to 15 inches (Vision 10 = 10" tablet only, Vision 13 = 10" tablet + 13" laptop, Vision 15 = 10" tablet + 15" laptop). 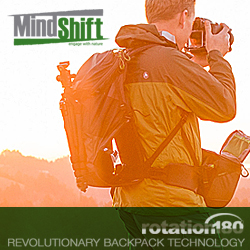 All three shoulder bags offer tripod attachment straps, which attach to web loops on the bottom of the bag. A luggage handle pass-through and reinforced top grab handle make the Vision a versatile traveling companion when attached to your roller. Other standout features include a comfortable shoulder strap, waterproof tarpaulin bottom, expandable water bottle pocket and a rain cover. Constructed with durable yet stylish weather-resistant materials, the Vision offers access, security, and the quality you’ve come to expect from Think Tank. "Great photography begins with a vision," said Doug Murdoch, Think Tank Photo’s President and lead designer. "The Vision shoulder bag series is designed to fit DSLR and Mirrorless camera gear with pro-sized lenses and hoods, making an ideal carry solution for professional and aspiring photographers alike." Vision 13: Fits one standard size body with a 24–70mm attached + 1–3 extra lenses, and a 10" tablet. Accommodates 70–200 detached. Vision 15: Fits one standard size body with a 24–70mm attached, 2–4 extra lenses, flash, a 10" tablet and a 15" laptop. Accommodates 70–200mm detached. non-slip, 3-ply bonded nylon thread. liner, 2x PU coated nylon 210T seam-sealed taffeta rain cover, 3-ply bonded nylon thread.